A couple of months ago, Kari from Five Borough Books asked me to read Lions of the West: Heroes and Villains of the Westward Expansion with her and participate in a blog discussion about the book. I jumped at the chance, not only because I wanted to get even more in-depth on this historical era, but also because Kari is really pretty awesome. 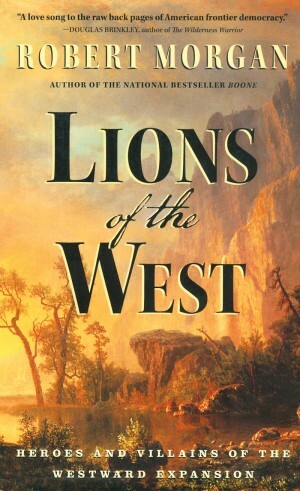 Lions of the West presents short biographies of eight men who were integral to the process of America expanding west across the North American continent. Kari and I chose to discuss each man in-dept over the course of a few weeks. We started the discussion here with the chapter on Thomas Jefferson. Below is our discussion of James Polk, a president neither of us think we would like much at all. We hope you enjoy the below discussion and that it piques your interest enough to delve more into American history and understand the complex relationships that existed, and continue to exist, between so many different cultures. Morgan talked about so many other people in this chapter, that I almost forgot it was supposed to be about Polk in the first place. It should’ve just been titled “Chapter on Mexican War,” though it still required me to search Wikipedia for the actual purpose and gain of the Mexican War. Polk, frankly, sounds like a terrible human being that I do not care to know more about. In fact, I think he’s the first person in this book about whom I don’t really care to learn more. Aarti: YES. I like how you say that Polk’s chapter should have been titled “Chapter on the Mexican War” because really, I think the ENTIRE SECOND HALF OF THIS BOOK was about the Mexican War much more than it was about the people. I’m sure it is interesting to military buffs, but as both of us read this book under the expectation that it was going to be about the people who drove westward expansion, the whole military detail part of the book was particularly disappointing to me. Kari: Right at the beginning of the chapter, I marked a passage that kinda indicates how contradictory some of Morgan’s representations of these individuals appears to be. I’m not sure it’s intentional, but it’s like he focuses on one aspect of these people for their chapter, and then other facets of their personality pop up later in the book and you’re like, “Wait, I didn’t get that impression from before...” Morgan describes Polk as “committed to Jefferson’s ideal of an agrarian America, ever expanding westward, offering new opportunity.” But remember how Morgan made it sound like Jefferson was just so interested in the West from a naturalist perspective? Now I really don’t think that’s the only side of Jefferson...and Morgan himself even hints at it. But why reveal these things in later chapters? Aarti: Yes again! It even happens within the same chapter. Morgan makes clear at the start of the chapter on Polk that many historians consider him to be one of our best and most effective presidents (this completely floored me). But then in the same chapter and in later chapters, he makes clear that HE doesn’t like Polk, and then in the Trist chapter talks about how it’s unbelievable that Polk got so much done considering how paranoid and bizarre he was. I think Morgan inserted himself into the narrative of his stories and biographies a little too much. He wasn’t unbiased about anyone, and I am left feeling like I got a very one sided view of everyone and everything that happened. Aarti: Haha, yes, and that Abraham Lincoln was one of his biggest critics until he did basically the same thing, x 1000, about 15 years later. I don’t really know how I feel about Polk, either. Quite frankly, I don’t remember learning anything about him in history class. And really, we learned much more about other people in this chapter than about Polk, anyway! I wonder if American history books try to keep quiet about him because he was such an unlikeable person? Kari: Though Polk was a super arrogant, grudge-holding President [can you believe how belittling he was of those he found a threat to his political position, putting himself above the country he was serving?? ], Morgan tries to make it clear that it wasn’t just his own personal power-driven mission to conquer the west; the whole country was big on it. This is the first instance in which Morgan lets us into the mentality of the rest of the country, and clearly expansion was on its mind—some persons wanting it for the freedom, some for the opportunities, and some (especially the ones in power) for the profit. Aarti: Yes, you’re right. But I wish we had some notion of why Americans felt it so inevitable to travel across the whole continent in the first place. I feel like that was a key component to Westward Expansion that I hoped would be described in this book but I never got there. Also, I feel like so much was mentioned out of context. I am glad you said earlier you had to Wikipedia a lot of stuff because I definitely did, too! I still have a very vague idea of what this whole “Nullification Crisis” was that he kept referring to so obliquely, and I wish Morgan had just spent some time giving us context rather than detailed battle stuff. Looks like we both really disliked this chapter! Blehhhh Polk. I wonder if anyone has learned much about him in school, because I think it's surprising that neither of us had despite him being considered one of the "best" presidents. PS, I'll have comments up on the last guys later today or tonight. I keep meaning to do it during the day at work and then forgetting to bring the book with me, so I have nothing to reference! I totally understand that because I no longer have the book with me, and don't remember what I wanted to say about those guys, either! It sounds like this section of the book was just totally deflating and boring, and I would have probably given up. I never knew Polk was such a crazy person, and just hearing these little tidbits about him makes me think that he was probably a very difficult individual. Add to that that this section was mostly taken up by the war, and I would have been a bit angry! I loved that you both saw eye to eye on this section, and your opinions really draw the reader into just what did and didn't work for you. Great review today! Everything I know about James K. Polk I learned in the They Might Be Giants song, which is really quite informative. Sounds like I should be pleased to have been spared reading the chapter. I can't remember if I've mentioned Patricia Wrede's Frontier Magic series here, but they're a fabulous alternate history take on westward expansion. They do an amazing job of capturing the spirit of everything being new and possible of the time, even though, of course, the West they're exploring is populated by basilisks and steam dragons. You have told me about the Frontier Magic series. I admit that, though I really like Wrede's Dealing with Dragons series, I am leery to try this series by her because of her decision to completely leave out the Native Americans in the history of the American west. I don't really think that's ok- they were a HUGE part of American history. My degree is in history but I studied WWI to present day so my knowledge of Polk is somewhat murky. However I do remember that I didn't like him much and now I know why!